Has New York City captured your imagination with its sparkling night skyline, the endless things to see and do, and the nonstop energetic pulse? Whether you’re drawn to live here (like me!) or visit, there’s no denying the magnetizing pull to experience incredible NYC. If you’re planning your first visit to New York City, this guide has everything you need to know. 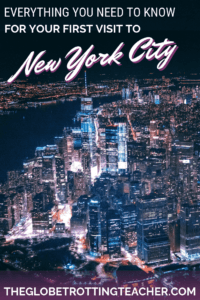 From itinerary ideas with maps, tips on where to stay and eat, and how to get around, you have everything you need to make your first visit to New York City an absolute success! 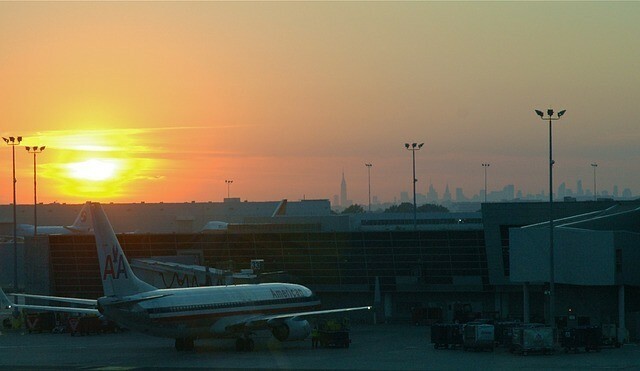 New York City has 3 airports nearby, JFK, Laguardia, and Newark Liberty in New Jersey. 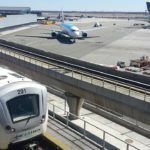 If your flight arrives into JFK or Newark, it is possible to take commuter trains and/or the subway to get into NYC. Visitors arriving into Laguardia, on the other hand, have fewer public transportation options. If taking a taxi or car service from Laguardia, brace yourself for at least an hour ride into Manhattan as the traffic can be horrendous in this area depending on the time of day your flight arrives. New York City taxis are available at JFK and Laguardia. It’s a flat $52 fare from JFK plus tolls and tip. The fare is calculated by the meter for rides from Laguardia. You will pay to sit in traffic. To save money, book a ride with the most trusted shuttle from the New York Airports. They’re comfortable, reliable, and far cheaper than a taxi. If you live in the northeast and are coming for your first visit to New York City, you’re better off taking a commuter train like Metro-North, NJ Transit, or Amtrak into the city. Or, for an even cheaper option, take a bus directly to New York’s Port Authority Bus Terminal, just 1 block from Times Square. The best way to get anywhere in New York City is to take the subway or walk. Driving and parking in Manhattan are a nightmare. And of course, the easiest way to get around either by subway or on foot is without carrying heavy bags. Many subway entrances have only stairs and sidewalks, restaurants, and other attractions are likely to be crowded and even restrict luggage and other big bags. If you need a place to store your bags, check out Bounce. They have 50+ locations around NYC where you can safely and securely leave your bags whether it’s for a couple of hours, the day, or longer. You can set everything up on Bounce’s website so you can drop and go without wasting time or worrying about having cash. 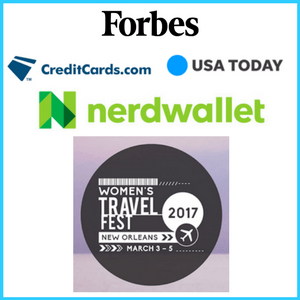 Be sure to use promo code GLOBETROTTINGTEACHER to save 10%! Think of New York City’s streets as a giant tic-tac-toe board across Manhattan. With the exception of lower Manhattan, streets run in a systematic, grid pattern. 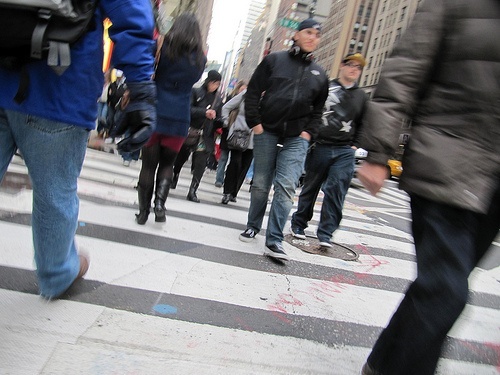 Here are a few tips to help you navigate the city like an expert pedestrian. Streets run horizontally from east to west. Avenues run vertically from north to south. 5th Avenue splits the east side from the west side. Address numbers get lower the closer the building is to 5th Avenue and higher the farther it is away from 5th Avenue. Broadway is the exception. It runs diagonally, interestingly enough, following an old Native American footpath. The New York City subway extends throughout the city. No matter where you want to go, it’s likely a subway line is heading in that direction. 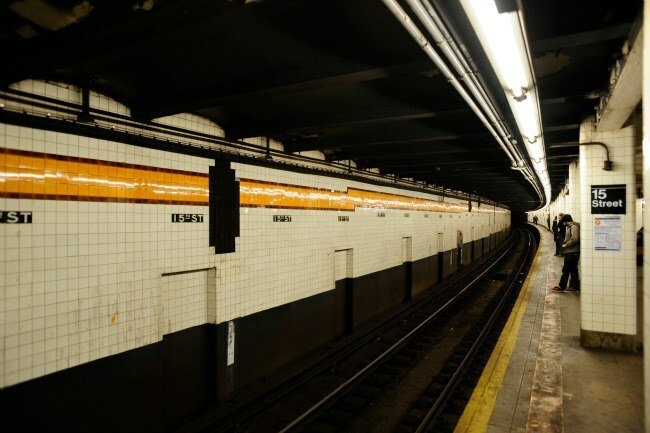 Here’s the subway info you need to know to look like a pro. Metrocards can be purchased from a ticket agent or from the automated machines in the stations. The small machines are for purchases made with credit cards or debit cards only. If you live outside the U.S., use 99999 as your zip code. You can buy pay-per-ride Metrocards or unlimited weekly or monthly passes. There’s a $1 charge to get the actual card before loading it with money or time. The subway fare is $2.75 per person each way with free transfers between the subway and city buses. If you plan to ride the subway at least 12 times, the weekly unlimited pass will save you money regardless of how many days you stay in New York City. Unlimited passes are good for just 1 person, as you can only swipe it once every 18 minutes, except if you’re making a transfer from train to bus. Download an NYC subway app or keep a PDF to save on your phone. I love the Exit Strategy app because it shows the subway map but also tells you which car will drop you closest to the subway exit. Don’t get confused between express and local trains. On the map, express train stops are marked with a white circle while local stops show a black circle. Bike rentals are plentiful. I wouldn’t suggest riding along the streets on your first visit to New York City, but scenic rides along the Hudson River bike path and through parks are great ways to combine sightseeing and transportation. Times Square with its neon signs, bright lights, Broadway marquis, crowds of people, honking horns, and yellow taxis, all combine for a whirlwind introduction to NYC. On your first visit to New York City, it makes sense to start at this iconic crossroads. 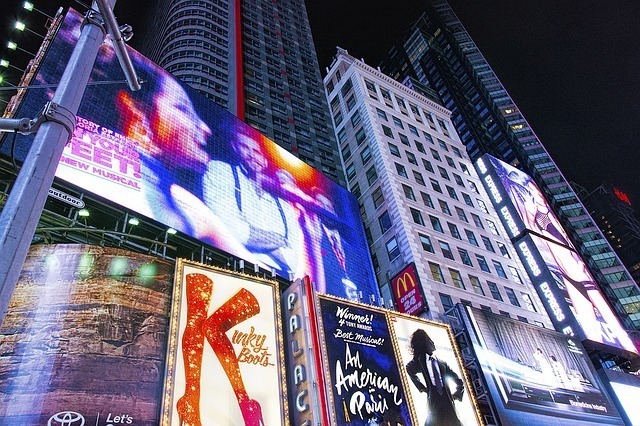 While you’re looking up, down, and all around Times Square, you’re sure to notice all the Broadway Theaters and the billboards advertising what’s playing. A TKTS Booth sells discounted tickets for performances on the same day. The TKTS app lets you know which shows have discounted tickets on sale that day. If you’re set on seeing a particular show, though, check Broadwaybox for advance purchase of discounted seats. Either way, seeing a Broadway show is an absolute must! Walk east along 50th Street, crossing over 7th Avenue, then 6th Avenue, to reach Rockefeller Center. On your way, you’ll see Radio City Music Hall and maybe even a Rockette or two! The plaza at Rockefeller Center hosts the Today Show and their summer concerts, as well as the 30 Rock Center skyscraper, home to the SNL studios and the observation deck at the top. Christmas in New York is so magical when the ice skating rink fills with skaters just in front of the famous Rockefeller Christmas Tree. Continue again east, out of Rockefeller Center, to 5th Avenue and see the striking facade of St. Patrick’s Cathedral. Head inside to tour the cathedral with a guide or on your own with the audio guide app. You’re now on 5th Avenue, famous for its upscale boutiques and department stores. Walk along the avenue for a for a first-hand look at the busy combination of traffic, tour buses, and pedestrians. 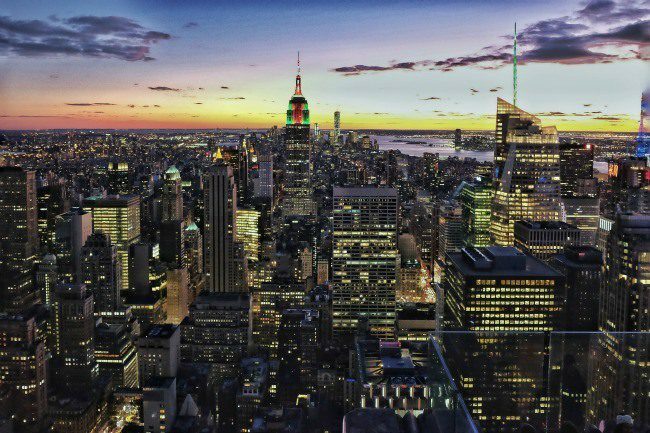 You’ll not want to miss a chance at a birds-eye view over New York City and the Empire State Building and the Top of the Rock offer breathtaking views! If you’re short on time or money (or both! ), visit just 1 of these amazing skyscrapers. The Empire State Building is a classic NYC landmark with an observation deck on the 86th and 102nd floors. If you choose the Empire State Building, head south on 5th Avenue (street numbers going down 50, 49, etc.) to 34th street. The Top of the Rock observation deck is on the 70th floor. The bonus is you’ll also get to see and photograph the skyline with the Empire State Building in it. 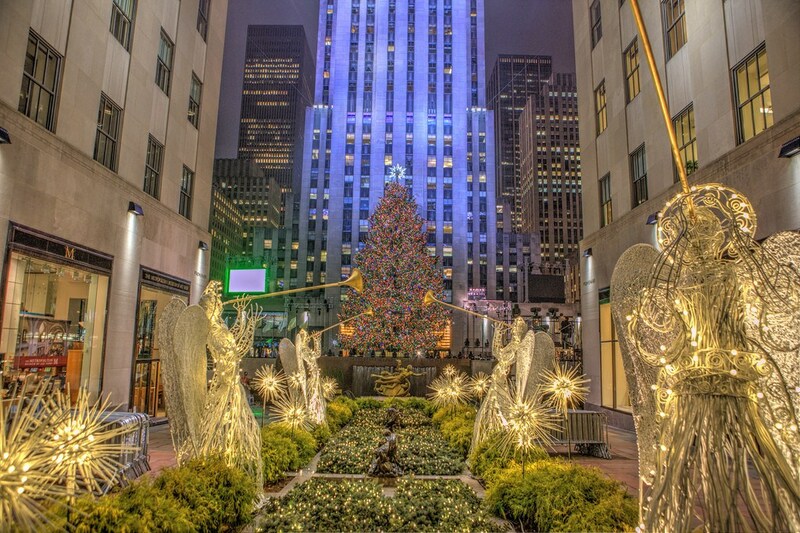 To visit the Top of the Rock, return to Rockefeller Plaza. Either way, purchase your tickets in advance to save time in line…or even avoid the line altogether! If you plan on maxing out on all of New York’s famous sights, save time and money with a New York CityPass, which gets you entry 6 NYC sights (3 set & 3 you choose) for one bundled low price! At some attractions, skip the line privileges are included, as well. Several museums line the east and west sides of Central Park. The Metropolitan Museum of Art is along 5th Avenue at 82nd Street. The American Museum of Natural History is on the opposite side of the park on 81st Street and Central Park West. Both of these museums are musts on your first visit to New York City. From the Temple of Dendur to Impressionist paintings by Monet and Renoir at “the Met” and the Prehistoric Halls and ocean and mammal exhibits on display at the Museum of Natural History, these stops offer the quintessential NYC museum experience. Choose 1 of these museums to begin your day. After a few hours, and likely the effect of museum fatigue, head outside for some fresh air and a stroll through Central Park. Central Park spans from 59th Street to 110th Street between 5th Avenue and Central Park West. 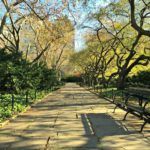 Walk the pathways and discover Sheep’s Meadow, the Lake, and all the fountains, monuments, gardens, and bridges along the way. Be willing to “get lost” which is nearly impossible if you use the buildings and the traffic noise on the park’s east or west sides as bearings. Download the Central Park app to show where you are in relation to the park’s popular sights. Meander to the opposite side of the park from where you entered and walk toward whichever of the above museums you have left to visit. Spend your afternoon enjoying another of New York City’s incredible museums. Pro Tip: New York CityPASS includes entry to both the Met and the Museum of Natural History. The Guggenheim is not far from the Met and can also be included with your CityPASS depending on which attractions you decide to visit. 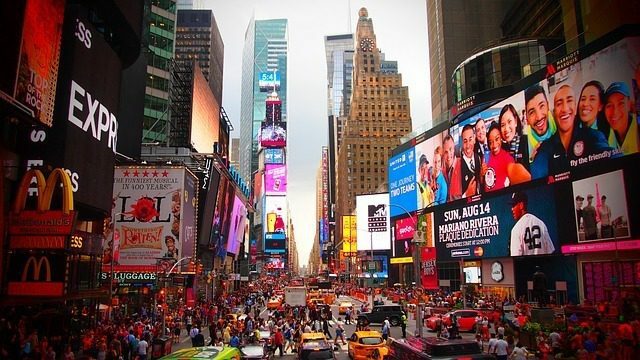 Yes, Times Square needs to be seen, but it should also be left. 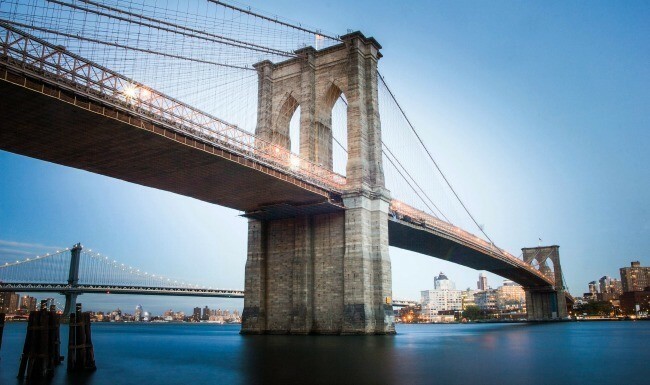 New York City has so much more to offer first-timers! Take the subway down to Lower Manhattan and do a bit of exploring. 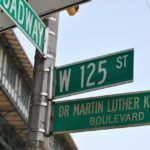 Whether you want to shop in Soho, see classic NYC in Greenwich Village, eat well in Chinatown, or want a detailed Lower Manhattan itinerary, you’ll glimpse more of the “real” Manhattan by heading away from midtown’s more touristy spots. 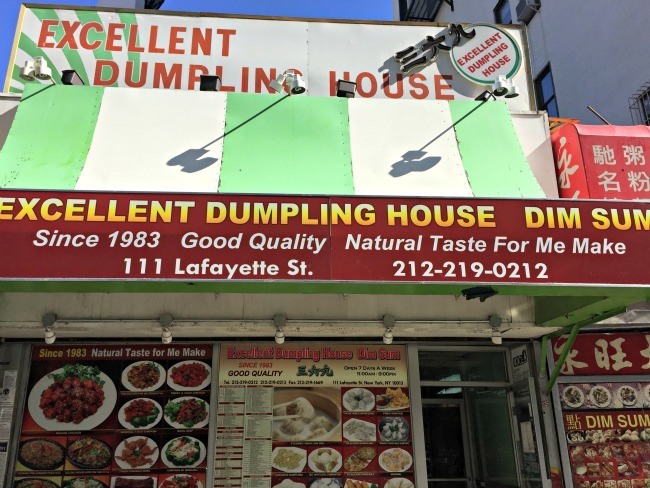 Shhh…My favorite “hole-in-the-wall” Chinese restaurant in Chinatown! A few iconic sights should not be missed while you’re at Manhattan’s southern tip. Walking across the Brooklyn Bridge is a must! Stroll along the pedestrian promenade to admire the New York City views and wonder over how such an impressive structure was built before the days of power tools. The 9/11 Memorial and Museum remembers and reflects on the events and the lives lost during the terrorist attacks. The experience is emotional but poignant and so well-designed. The reflecting pools are in the original tower footprints with the names of victims inscribed around the edges. 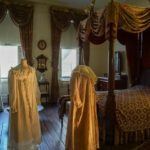 The museum houses artifacts like a damaged firetruck and the personal anecdotal accounts of the day. The memorial and museum simultaneously honor the fallen, inspire a sense of Patriotism, and encourage a continuing faith in the goodness of humanity. It’s also a great opportunity to see the sweeping city and harbor views from the One World Observatory, one of the best things to do in NYC. As with any New York City attraction, purchasing tickets in advance to avoid waiting in line is a smart way to maximize your time. 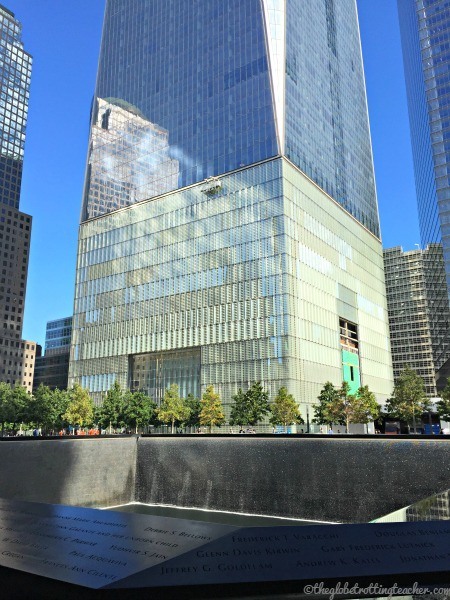 As you ask yourself is the New York CityPASS worth it, know that the 9/11 Memorial & Museum is included with CityPASS but the One World Observatory ticket is not. 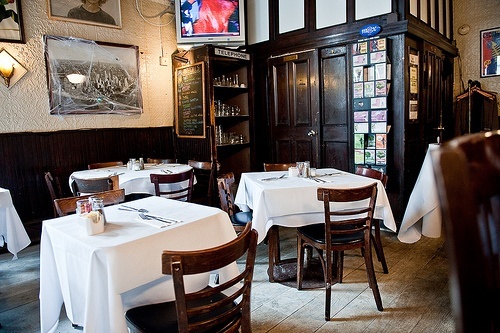 After visiting the museum, walk along Manhattan’s west side, through the West Village and Meat Packing neighborhoods. The streets are small and, sometimes, even lined with cobblestones. Explore the cafes, beer gardens, and shops on your way to the High Line entrance at Gansevoort Street. It’s an elevated urban park built along abandoned train tracks. The views, street art, and ambiance along the walk will leave you feeling like a true New Yorker. For a deeper look into the area, join a High Line and Meatpacking Neighborhood tour. Not only, do you get the High Line views, but you’ll also see architecture and art, as well as tour Chelsea Markets. Pro Tip: Another (obvious) sight to consider, depending on how much time you have in New York City, is the Statue of Liberty. 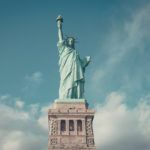 You can take a boat ride tour to Lady Liberty or opt to pass by from a short distance on the free Staten Island Ferry. 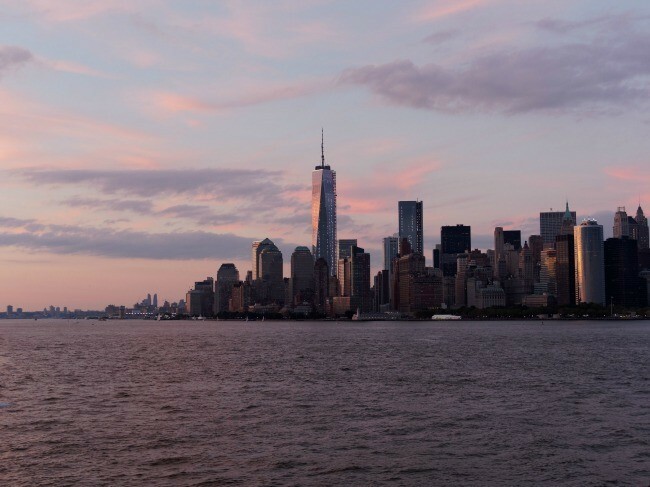 Either way, the views of Manhattan from the water are stunning! 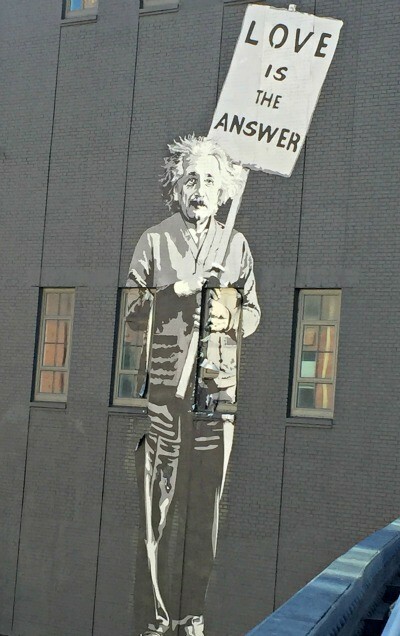 See the best street art in New York City by spending a couple of hours in Brooklyn. Watch a baseball game. Head to the Bronx on the “B” “D” or “4” trains to see the Yankees or the “7” to Queens see the Mets at Citi Field. Go to a market in Brooklyn. Smorgasburg is a foodie’s delight and Brooklyn Flea sells vintage and antique clothing, housewares, and collectibles. Traveling with children? They’ll love a day at the Bronx Zoo. Coney Island Amusement Park and Boardwalk are right in Brooklyn and a perfect place for fun and ocean breezes to cool off from NYC’s summer heat. Stroll through the Botanical Gardens in Brooklyn or the Bronx. They’re gorgeous in the fall! Fall is the best time to visit New York City! 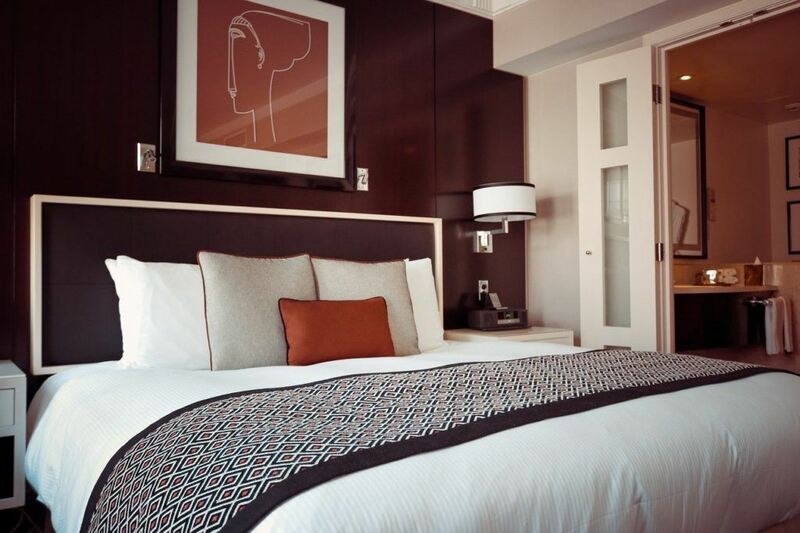 The best “where to stay” tip is to be within comfortable walking distance to a subway station. From there, you’ll be able to access all the places you’d like to visit. For a detailed breakdown of the best places to stay in NYC, neighborhood by neighborhood, head over to my where to stay in New York City guide. New York City hotels are quite pricey, making it ideal if you have hotel points to use for an award stay. If you have credit card rewards like I do, Hyatt is a Chase transfer partner with solid redemptions. IHG points can be earned with the cash and points trick. If you don’t have enough points to use for an award stay, New York City has hotel properties in all major hotel loyalty programs, which could make for a lucrative points-earning opportunity for paid stays. Use AwardMapper to check for hotels with loyalty programs and where they are in Manhattan. If you don’t collect hotel points, these hotels are ranked as a top value in New York City. 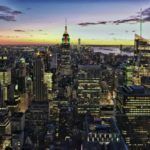 Keep in mind value is relative in NYC and could mean value in terms of location and amenities, too. You can also search for more great hotels on TripAdvisor, on Booking.com, or find a few more affordable hotel choices here. I’m not a food critic, but I’m no stranger to a fantastic meal. If you’re looking to let your inner foodie out, this where to eat in NYC guide has more than enough to make your taste buds smile. Whether you’re looking for authentic Indian food or the best veggie burgers in NYC, New York City has an endless number of fantastic restaurants. Just promise yourself to stay away from tourist trap chains and fast food! All that’s left now is to pack! You’re ready for a successful first visit to NYC! So, have you traveled to New York City? What tip do you recommend for a first visit to New York City? This was an awesome post! You have definitely added fuel to my desire to visit NYC! I might just have to find time to go after school gets out in June. Not at all! Living in NYC was my dream since I was a little girl. Any trip to the U.S. has to include a first stop in NYC, Natalia. I hope you can make it for a visit soon! 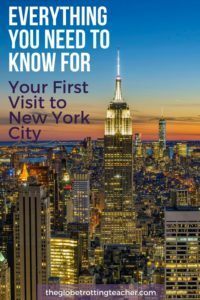 This is a fabulous guide for any trip to New York. well done! A complete guide to the Big Apple :). I wish I had this when I visited NYC. All things said, I always stayed out side New York, in New Jersey and take the train to NYC . I found the stay is less expensive outside NY. Hoboken and Jersey City are excellent options in New Jersey for cheaper hotels, Vasu. The PATH train makes it quick and easy to make into NYC. Great tip! 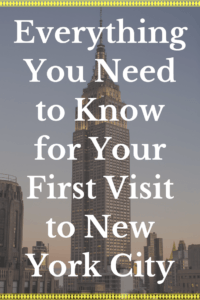 Terrific post on what a first-timer should see in NYC. You did a great job culling what could have been a ton of information into an easy to read digest. Great work! Your posts are always so practical and helpful, Jackie. This is great for someone who doesn’t know New York. In fact, there are some great pointers for everyone – a great tip for us Canadians about using 99999 as your zip code if buying a metrocard! I can’t wait to go back … and finally see the Statue of Liberty which I miss every time. What a fantastic resource! I would add Mandarin Oriental, Four Seasons (not the new one, but the old one) and Gramercy Park hotel on the luxe end. I’ve loved my stays in all. But that’s the thing about NYC… so many great hotels and so little time! I knew of the famous grid system on NY and how it was built but it was interesting and really helpful to have the streets and avenues orientation and the public transport info. A city that everyone wants to visit but need quite a bit of research beforehand to make the most of it. So true, Sia! You really should have a little sense of how to get around or else you could miss so great NYC spots. Oh Mansoureh, NYC is such a great city. I hope you can visit soon! 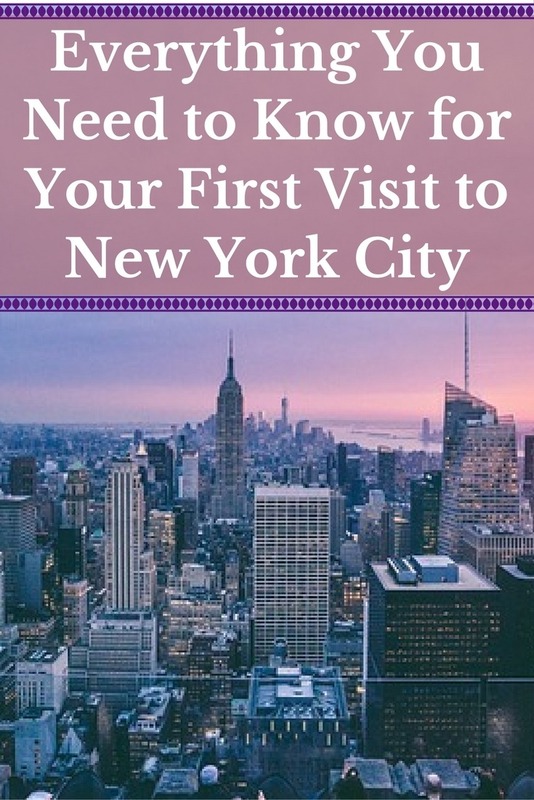 Tips, tricks and itineraries for New York…so useful this post is. I have always felt that larger cities are so difficult to absorb, because of their sheer size. You tend to miss out on different angles and ways of experiencing the place. Posts on larger cities are so much needed. Thank you, Punita. Big cities certainly have so much to see and do. It’s hard to know where to begin. PS: My favourite sweet in NYC was a choc chip cookie from Levain Bakery. De-licious! Thanks so much for reading and for your kind words, Patrice. 🙂 How awesome you made it to NYC. I’m so glad you loved it and hope you can make it back soon! Levain Bakery has the best chocolate chip cookie for sure. This is a wealth of useful tips! So informative….. NYC is on my radar. Not sure when I will get to go there but whenever I do I will come back to this post. And definitely saving it on my Flipboard! We leave for NYC in 6 sleeps! So excited and this guide is just perfect for us. I’ve been reading and organising and planning for months and months and months but this is one of the most succinct finds that will help us immensely. Thanks for helping a very excited Australian family. I’m so glad you’re giving NYC another chance, Leigh. Let me know if you need any other pointers. NYers always want you to love their city. I LOVE NYC! Can’t wait until my next opportunity to come back. Last time I went with some friends, we stayed across the Hudson in Jersey City, about 2 blocks from the PATH station. Been there twice and have done the “touristy” stuff, now I’m ready for a week of exploring the boroughs. What a fantastic article!! Going to NYC for first time in July….I know you all say it’s HOT in Summer but hey I live in southern Texas!!! It can’t be any hotter than here…LOL. Great tips and I’m going with my daughter who’s 21. We will be there for 6 nights. Can’t wait to plan out each of our days. My only concern is getting from airport to hotel. This is a great post…very helpful and informative! I’m visiting NY for the first time this coming July. I’m driving from WV and worried about parking and traffic. Any pointers?? Hi Amanda, Thanks so much for reading and I’m glad the post is helpful for your upcoming NYC trip! 🙂 So, I’m not sure what part of town you’re staying in, but I’d look to park my car away from the midtown (Times Square, Rock Center, Broadway) area. I’d go uptown to the west 80s, 90s, 100s street and look for street or garage parking there. NYC has street cleaning so for example on the street where I live, you can park on the street for free except for Tuesdays & Fridays between 10am-12pm. You’ll have to check the street signs wherever you park. If uptown is too far from where you want to be, look far west in midtown, like close to the Hudson River and West Side Highway. There are relatively cheaper outdoor parking lots. No matter what you decide, park your car for your stay and don’t drive it again. Traffic is truly awful and NYC sights and attractions don’t have any parking lots. So you’d just be going from one paid lot to another and losing time by sitting in traffic. Also, not sure if you have the electronic toll system EZPass in WV, but if you do, bring it. It’ll save you time when you cross into Manhattan via bridge or tunnel. Good luck! How funny! I am also from WV, planning to drive and I was wondering about parking. We do plan on parking for the duration and using the subway but now I know to check out parking areas other than what is available at our hotel. Thanks. Such a small world, Tammy! 😉 Definitely worth it to look outside of your hotel area. It most certainly will be cheaper. Good luck! Great break down of the city. I am visiting for the first time tomorrow and I only have a day to explore. I was feeling a little overwhelmed and now I feel like I can do it! This is wonderful and incredibly helpful! We are bringing our three school-aged sons in October. You have made me even more excited and comfortable. Thank you! Thanks for reading, Danielle. Hope you have a great trip to NYC! Hi I think your blog is well informed thank you very much. I am wondering if anybody knows when the tree lighting happens and when sacks has their laser show as well as Bergdorf’s Christmas windows if you can let me know that would be great thank you so much. Such great information – thank you so much!!!! My husband and I are planning a trip this December 2018. I am a Christmas nut and am super excited to experience my first New York Christmas. I can’t wait to see all the lights, decorations, and just the magic!! Any pointers on the best way to tackle New York at Christmas time? I’m sure it is crazy busy that time of year and the lines will be never ending. I’m so glad the guide was helpful, Suzette. NYC is spectacular at Christmas but yes it is crazy busy. I have a Christmas in NYC guide and I’ll be updating it over the weekend for 2018. But there’s still plenty of great info that still applies from last year, as well. Feel free to comment again here or on that guide if you have more questions. 🙂 Thanks for reading! Thanks for reading, Junas. I’m so happy to hear the guide was useful for you. I don’t publish links in comments, so your video link was edited out. I remember the first time I went to New York. I stood in the middle of the Times Square on a very crowded evening. I have never in my life seen so many people in the street at once. I was a interesting experience. I learned a lot about the New York lifestyle. Thanks for reading, Henry. New York City is a city like no other, that’s for sure. Jackie… my husband and I are planning our first trip to NYC this November. Our kids live in Lakehurst, NJ so we’ll be staying with them. Any suggestions on the best way to travel from there into the city? We are taking our kids and grandkids to see Aladdin on the 11th, which I just realized is Veterans Day. Anything we should be aware of because of the holiday? everything you said makes sense. good information. Thanks for reading, David. Enjoy NYC. Thanks so much for reading, John. Thanks for reading, Giselle. Enjoy NYC. Thanks for reading, Nur. 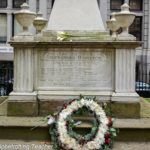 I don’t think it’s necessary to hire a tour guide for your entire trip to NYC, but you may want to consider day tours for specific things, like if you wanted an NYC overview or a neighborhood tour of lower Manhattan. Typically, getting underground to the subway is the best way to escape chilly winds. But, keep in mind, only specific subway entrances will have elevators for a baby stroller. New Yorkers often carry the stroller down or up the subway stairs. I might consider looking at a hop on hop off bus to get around outside of Times Square and the midtown Manhattan area (Rockefeller Center, Bryant Park, Empire State Building). The one drawback to this is traffic. The weather will be chilly (likely between 30-45 F/-1-8 C), so it’s important to dress in layers and take advantage of breaks inside shops and places like Grand Central Station, and museums. Wow, all the information you provided was very informative. I just booked flights for New York for my family in April! Yay! I was getting a bit overwhelmed with researching where the best places to stay, visit, etc. as this will be our first visit to NY and I am so glad I found your post. I will be purchasing the city pass for sure. Thank you! Straight to the point useful information. My husband and I are headed to NY in March for the first time and since we booked the flight all I can do is plan our trip. This has been the best post I have come by. Thank you so much for putting this together! Very good information. Lucky me I discovered your blog by chance (stumbleupon). I have book marked it for later! Very informative. I’m visiting NYC for the first time in a couple of months and I have no clue where to stay. Of course we want to do lots of sightseeing, attend a broadway show, and I can’t wait to eat some good pizza! Any recommendations on cost effective places to stay? Thanks so much for reading, Cassandra. I have a Where to Stay in NYC guide for you to use to help you find the right place to stay. As long as you are close to a subway line, you can easily access many parts of NYC. So a place like the Upper West Side, for example, is not in Times Square but the subway line will help you get there in just minutes. Hope that helps and you have a great NYC trip! This was SO HELPFUL!!! 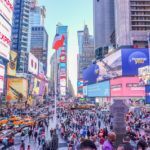 I am planning my first trip to NYC on my birthday in September and was feeling a bit overwhelmed thinking of how to get around and things to do. Also about where to stay.. What will the weather be like? Will i need to pack my faux fur? (LoL). I am SO printing this out to read again! Lol! Thanks for reading, Tonj. Faux fur for sure! 😉 Enjoy NYC. Yes! So glad to hear that, Anah. 🙂 Appreciate you reading and glad your trip was so fantastic. Thanks for the useful information! Family of 4 will be visiting NYC for the first time in April 2019. We will only be there for 2 days 1 night. Is it possible to do 8 attractions in 2 days? I was looking into buying the 2 day New York Pass. Thanks for reading, Ann. I think 8 attractions is a lot in 2 days. The bundled sightseeing cards can be a great deal. I’ve written about the New York CityPASS. But, expect things to take longer in NYC. There’s traffic or a subway delay. People fill the sidewalks so you can’t walk as quickly as you might think. The line at a restaurant or attraction is longer than expected. For these reasons, you and your family could end up feeling really rushed. If you do decide to give it a go, I’d stick to using the subway. It’s the fastest way to get around. Hope you have a great trip to NYC!